Meanwhile, temperatures are expected to plunge to minus-10 degrees by Thursday night. 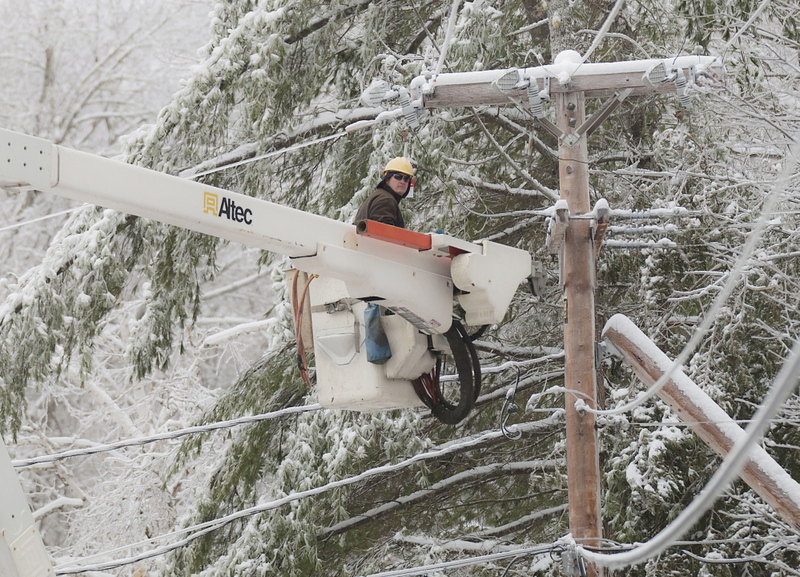 Although utility crews made progress during the day Sunday in restoring power to customers cut off by last week’s ice storm, another winter storm pushed into the state Sunday night, bringing heavy, wet snow that caused new outages. Over the course of six hours Sunday night, Central Maine Power Co.’s outages rose dramatically from 620 to 5,614, with Waldo County the hardest hit. A crew sets up to restore power near Brewer Lake in Orringtonon Sunday. 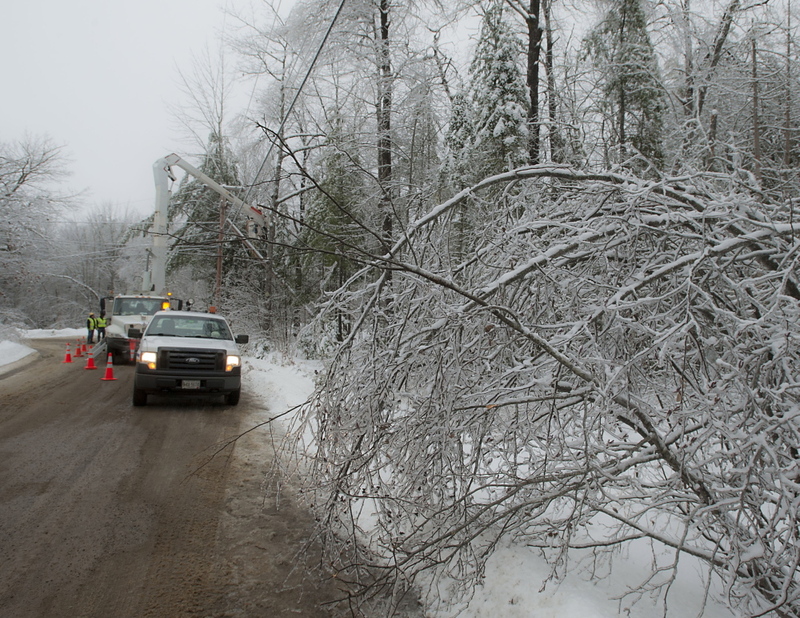 Bangor Hydro line crews working with Asplundh Tree Service crews have been in the King's Mountain area of Orrington since Dec. 26. Maine Public Service lineman Craig Hobbs works to restore power on the Perkins Point Road off Brewer Lake in Orrington onSunday, Dec. 29. 2013. Downed limbs on the Perkins Point Road off Brewer Lake in Orrington on Sunday. John Carroll, a CMP spokesman, said the wet snow falling on power lines and tree branches was causing a whole new round of power outages. By 6:30 a.m. Monday CMP was reporting 3,900 outages, about 2,100 in Lincoln County. Bangor Hydro Electric Co. reported 1,600 customers without power at 6:35 a.m., more than half in Hancock County. The outage numbers reported Sunday night were down from a peak of 120,000 on Tuesday. State police reported treacherous driving conditions Sunday night caused by the storm. They investigated rollovers on the Maine Turnpike in Gray and Biddeford. There were no injuries. 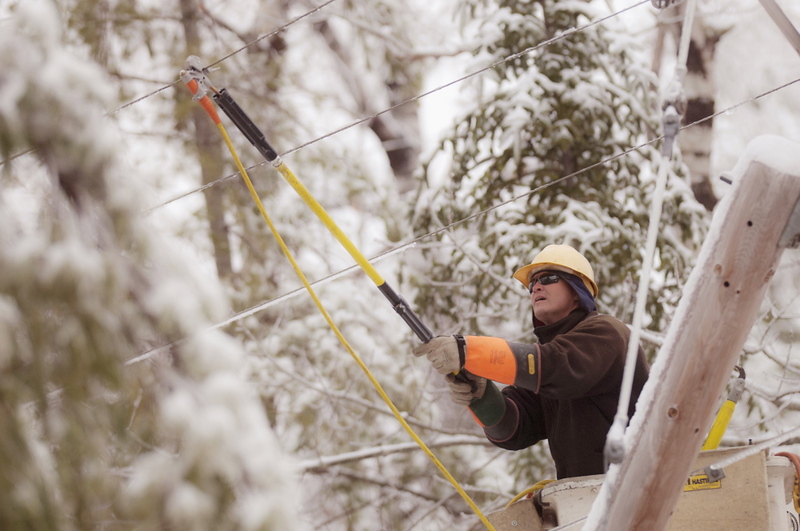 Many of the outages remaining from the ice storm were being repaired one by one, as power crews worked in remote areas. Outages continued to occur during the day Sunday as the ice melted and freed tree limbs snapped into power lines. Bangor Hydro officials said during the day that they expected to have all ice storm-related outages repaired by the end of Wednesday. But that may be an overly optimistic prediction, especially if Sunday night’s snowstorm dumps the predicted 6 to 10 inches of snow over the Bangor area. 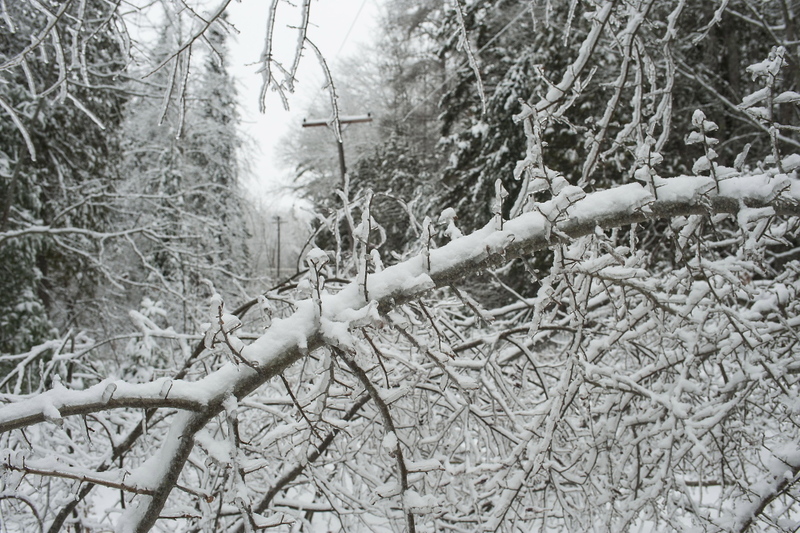 Faloon said heavy snowfall accumulating on ice-covered tree limbs could produce enough weight to cause those limbs to break and fall on power lines, setting off another onslaught of power outages. That appeared to be happening late Sunday night. Faloon said she has spoken with line crew electricians, who have told her it is taking on average about four hours to restore power to a single customer in the area hit hardest by the ice storm – Hancock County. She said the location of the homes – some are in remote areas – has caused the restoration work to be painstaking and slow. Faloon said Bangor Hydro started receiving reports of power outages Dec. 21. The snow, ice and outages have not let up since then. Sunday’s storm, which started as rain about 4 p.m. Sunday in the Portland area, later switched to snow and was expected to wind down by dawn. James Brown, a meteorologist with the National Weather Service in Gray, said the fast-moving storm was forecast to leave 6 inches of snow in Portland, 2 to 4 inches in coastal York County and as much as 6 to 10 inches over inland areas. Temperatures will plunge from the low 30s into the teens during the day Monday. Daytime highs will be in the teens and dip to near zero at night through Wednesday and to minus-10 degrees Thursday night. Another storm could bear down on the state on Friday, according to the National Weather Service. The wintry weather has shown no signs of easing since Arctic blasts started blowing into the state around Thanksgiving, followed by waves of snowstorms this month. As of Sunday morning, Portland had received 25.4 inches of snow this season, 11.4 inches above average. Temperatures averaged 24.9 degrees for December to date, 4.4 degrees below normal.